Nikon D300, Nikkor 10.5mm f/2.8, 1/2000 s, f/5.6, ISO 200, SPL waterhousing. 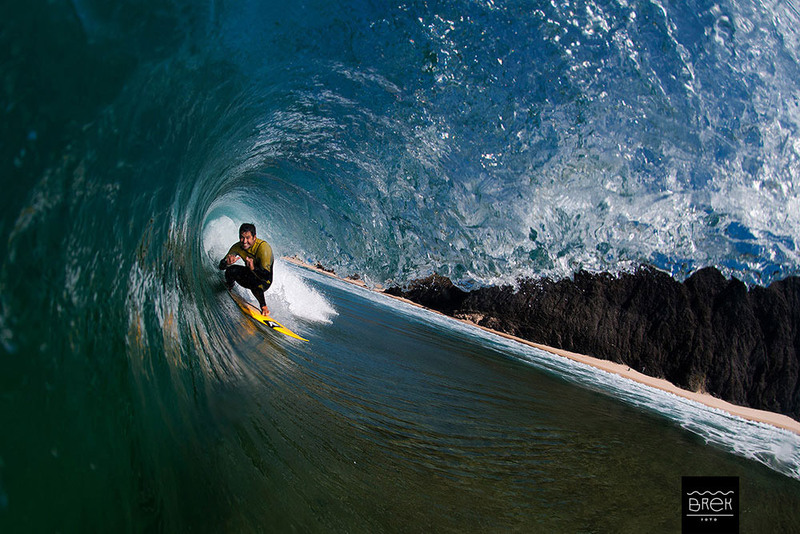 This kind of tube shot, although dificult to make, isn´t exaclty new, hawaiian photographers like Brian Bielmann have done it for years. I just tryed to make it unique by including Portugal´s Costa Vicentina landscape in it and was lucky enough to have former world top surfer Fábio Gouveia around. I checked the swell forecast and during this beautiful morning I hooked up with Fábio and at praia da Cordoama. The water was clear, the light beautiful and the offshore winds were shaping the waves perfectly on this sand bank so I decided to set up my waterhousing with my fisheye dome port. Before carefully closing it, I had my camera set to manual at f5.6, the sharpest aperture of this lens, 1/2000 s to freeze the action, base iso of 200 and manual focus to 4 feet. I didn´t forget to rub some potato juice on the dome port to avoid water droplets and hit the water with my 5mm wetsuit and diving fins. After swimming for an hour or so this wedgy tubular wave bowled near me and Fábio pulled in the tube and flew by me smilling. Sometimes this shot is ruined by mug expressions or even surfers closing their eyes. I pointed the camera at him steadily and got the exposure right so not much post processing was needed and having a raw file really made it easy to make little burning and dodging. His choice of board color also added some spice to the picture and it amazed us since we first checked it on the camera, The Surfers Journal magazine also loved it and made a cover with it. I think what makes this photo is the contrasting colors, the sense of the place and the charismatic personality of the surfer. I really have to salute you and your fellow photographers. It is a tough job. I think some people will never pick up on the key phrases of your story such as “putting on my 5 mil.” and “swimming for an hour”. It takes a lot of time and energy to try to position yourself for a magical shot and who knows…it might not even happen at all. Obg! É preciso uma especie de sorte ou melhor uma adaptacao ao caos.